A career journeyman: Jim Moore bounced around the minors for years, never quite able to get over the hump and earn a call-up to the show. His was an up-and-down career coming into 1984. It seemed like every time he would score a huge discount on a four-star hotel, he'd follow it up by sitting along the roadside after the team bus broke down, unable to secure a replacement for hours on end. 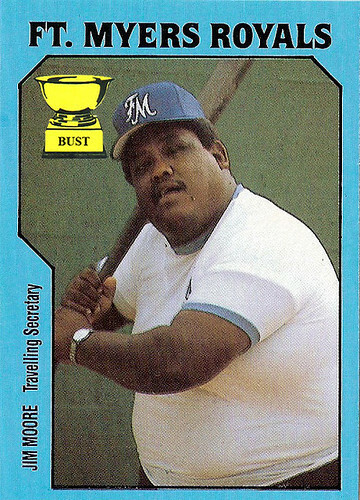 But Moore's big breakthrough finally came that same year with the Fort Myers Royals. Using his rugged good looks and sharp sense of style, Moore sweet-talked his way into the heart of one of Tampa's richest female executives, persuading her to sell her Learjet to the team for just pennies on the dollar. The decision-makers in Kansas City took notice, and Jim Moore was soon on his way to the bigs, saying goodbye to the minors forever and leaving yet another woman brokenhearted.